Lynn over at Happier than a Pig in Mud is having her monthly cooking challenge. And this month is any recipe from or using Pillsbury products. I am a huge fan of Pillsbury products. I consider my fridge and freezer part of my pantry and keeping some of these items on hand is perfect. 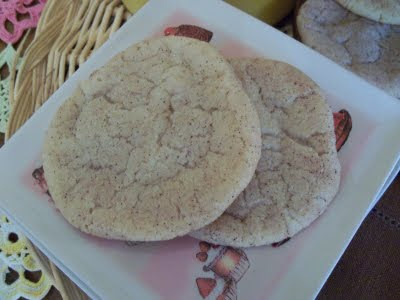 One of my favorite I always have in the fridge or freezer is Pillsbury Sugar Cookie dough. And that is just a few ideas! Today we are making quick Snickerdoodles with this cookie dough. Combine cinnamon and sugar in a bowl. Grab enough dough to make a cookie. Before you roll into a ball, smash it into the cinnamon/sugar and then roll it. Once you roll it, roll the ball around in the cinnamon/sugar again to coat the ball. Put all the balls on the cookie sheet and follow directions on the cookie dough package. That’s it! Super easy and everyone loves these! You can freeze a batch already baked or raw with your added ingredients and keep in the freezer for a quick treat. So, grab a cookie and I’ll pour you a glass of cold milk and you can go visit all the other participants joining Lynn today! I will also be linking to Foodie Friday! Great ideas! The snickerdoodles look great! I love the new look to your blog with the extra large photos. Have a wonderful week! Thanks for stopping by my little blog :0) Glad we have something to relate to, but not glad that it's painful! I love your blog!!!! Yummy! My kids love the Pillsbury cookies. I've never thought about doctoring them up with cinnamon sugar. Thanks for sharing! Beautiful cookies! Love sugar cookies and easy one's even better! Those look fantastic, Diann. I use the Pillsbury cookies all the time and never thought to add anything to them, thanks for such great ideas!